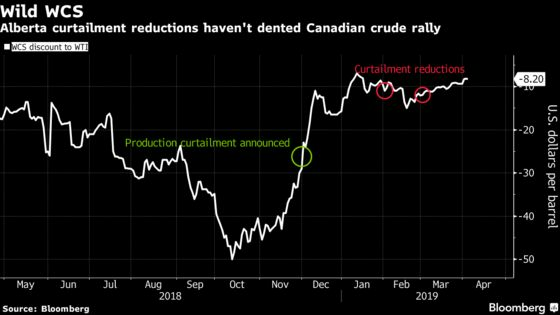 (Bloomberg) -- The stubborn, sharp rise in Canadian heavy crude prices may finally falter later this year, when swelling output overwhelms a pipeline system that will be lacking a key project producers had counted on, according to Deloitte. Western Canadian Select crude prices have more than doubled since the end of November, buoyed by the Alberta government’s output limits for drillers in the province. That gain has made it less economical for drillers to get their crude to refiners by rail, and the government has reacted by easing the production caps. But the price has yet to respond to those adjustments, hovering at stubbornly high levels. Those prices may finally slip later this year, widening the differential to U.S. crude, as Cenovus Energy Inc.’s expansion at its Christina Lake oil sands project and Canadian Natural Resources Ltd.’s Kirby North project add 100,000 barrels of production, said Andrew Botterill, Deloitte’s national oil, gas and chemicals leader. At the same time, Enbridge Inc.’s Line 3 expansion, which was expected to add 370,000 barrels of shipping capacity late this year, is being delayed by a year.